While the lamb is arguably the most important ingredient, next to that would be what you put on it. 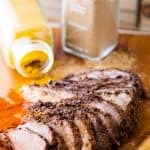 This traditional spice rub brings all the important mediterranean flavors with just a subtle chili powder and turmeric kick. The best part it’s as easy as putting all the ingredients in a bowl, and rubbing it all over the roast. No. Really. That’s exactly what you’re going to do. You’re welcome to use fresh herbs in addition to the ground spices. You’re also more than welcome to opt for the pre-packaged short cut of dried spices. Generally speaking, fresh is best but you know when it isn’t? When you don’t have fresh herbs or the idea of dirtying a cutting board and chopping up vegetables is incredibly unappealing or you’re just dang busy or you really just don’t care about the difference – go for the dried. Trust me, the Food Network isn’t here to judge you. If Ina’s voice keeps resonating in your mind (“Fresh parsley, fresh oregano…”) just use half of what the recipe calls for since they’re a bit more potent. Then roast it, rest it, slice it, and top it. If you ask me, topping it is the best part. Customized easy lamb gyros coming up! When it comes to lamb, different situations call for different temperatures. Typically a lamb roast would be cooked medium in this house (medium rare lamb roast is just a touch too gamey and chewy here) for these easy lamb gyros we’re shooting for medium well to almost cooked through. While vision of hockey pucks may dance through your head, trust me, it will be all too easy to consume the final result. The thin slicing will keep the chew factor easy and flavor solid. 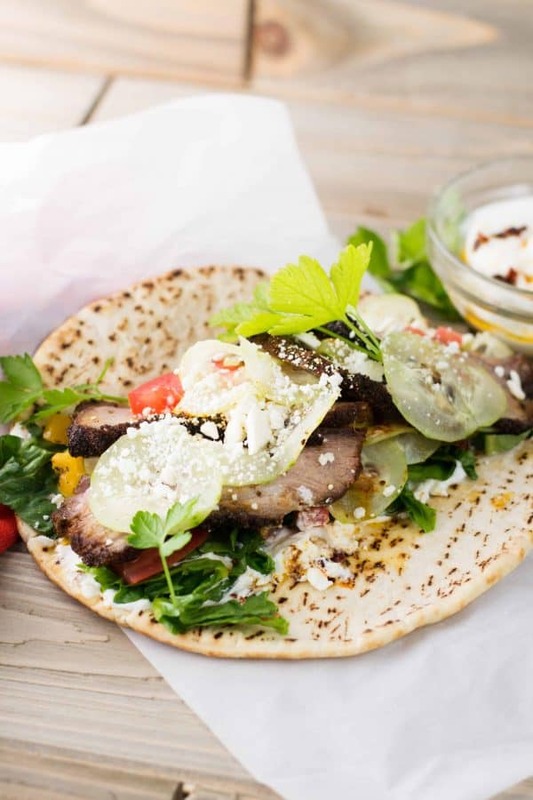 These easy lamb gyros with traditional spice rub are perfect for make ahead meals, meal prep, or even a group dinner. Step outside Make Your Own Pizza night and Make Your Own Gyro. Fresh crunch veggies, a little spice and a whole lot of flavor you’ll be praised for switching it up. To serve alongside your Easy Lamb Gyros, try this Rice Cooker Quinoa with Dried Cherries and Feta from Charity over at Vintage Kitty. This Greek Cucumber Salad from Wanderspice is the perfect cool and healthy side dish. Or if you’re in the grilled veggie club (of which I may be the self proclaimed President) try these Grilled Veggies with a Spicy Yogurt Sauce – we’re talking like hoard the whole platter don’t share kind of good. That Spicy Yogurt Sauce, ugh, back off everyone. Just kidding, food this tasty is too good to not share. Who will you share your tasty eats with? Traditional mediterranean flavors surround tender, thin sliced lamb with a cool yogurt sauce and fresh crunchy vegetables. Preheat oven to 375°F. Remove lamb roast from packaging. If the roast comes in a net, remove that as well. Pat dry and set aside. Combine spices in a medium sized bowl. 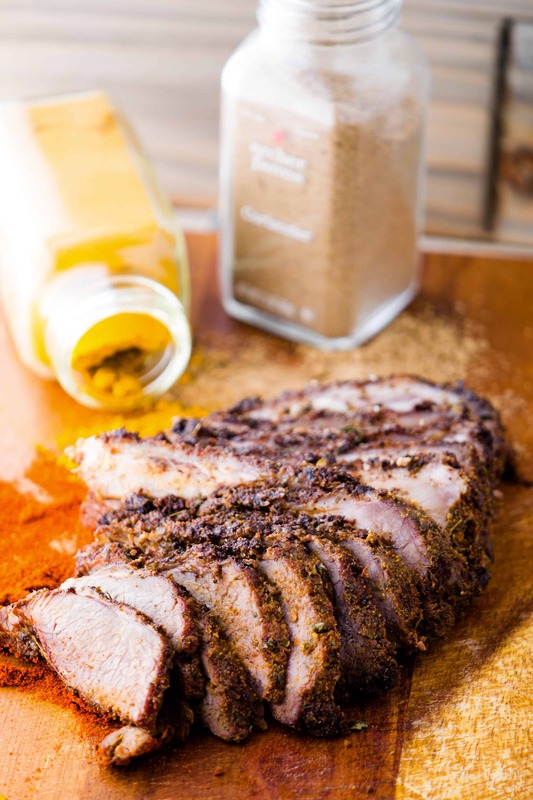 Generously rub spice mix over entire lamb roast. 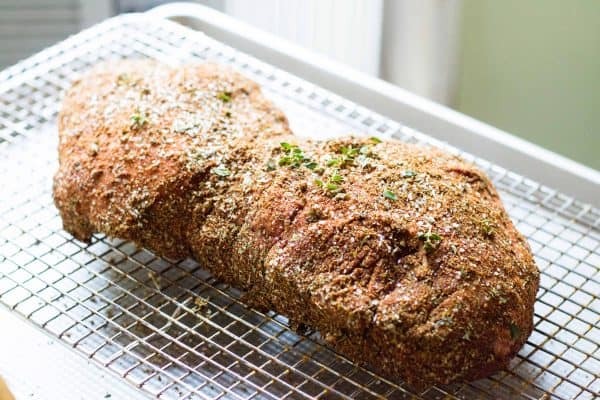 Place roast on a lipped baking sheet or in a roasting pan. Tuck the ‘tail’ piece (small thin end) under the roast. Cook for 1 hour, roast should be medium well to well done. Let cool 15 to 20 minutes. After the roast has rested, use a sharp knife to slice the lamb roast in very thin pieces, 1/4″ to 1/8″ thick. While the roast is resting, prepare the remaining ingredients. 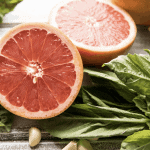 In a small bowl, combine yogurt and fresh chopped mint. Mix well. Chop tomatoes and cucumbers. Julienne lettuce. Using either the microwave on lowest setting or a gas stove, warm pita bread. If using a gas stove top, turn on the lowest heat setting and carefully toast the pita on both sides for about 15 to 20 seconds. 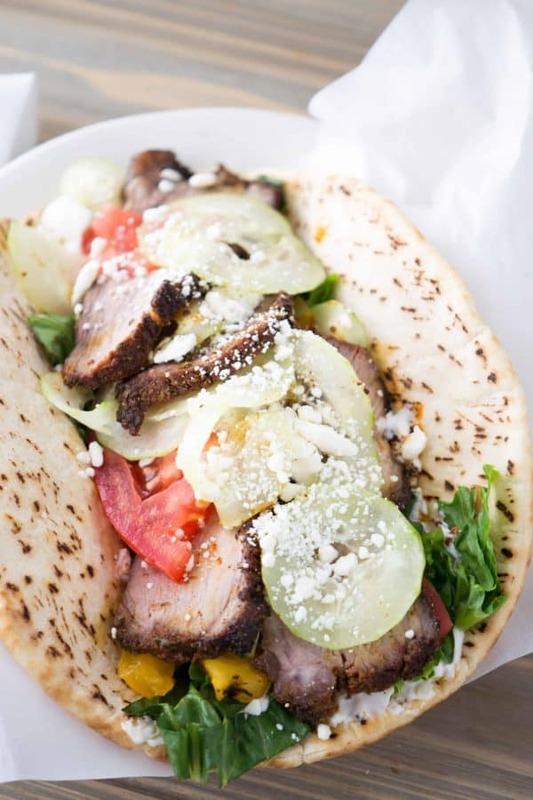 Create your own personalized gyros, with your favorite combination of toppings! This looks delicious! My girlfriends and I cook together once a week and we will be adding this to the list!! Yum! My mouth is watering looking at these delicious gyros! These sandwiches are a favorite of mine & my husband’s! So glad I came across this! These are mouth watering! I love your photos too! I will have to try and create this at home!